My two daughters are grown up, but when they were young we had the good luck to be able to go on many family trips together. Often these were long trips. My eldest daughter enjoyed many flights over the Atlantic to see her father at Holy Loch Scotland where he was stationed. We would hop a free stand by military flight, and enjoy a few weeks touring Scotland and England. It was two young children we flew to Puerto Rico each winter. The Navy Base there offered a wonderful break from cold New England winters. But the flights were boring and long. I have this fantasy that flying with young children today is a breeze with all the new technology. Parents just have to pack up a laptop or even iPhone to have endless entertainment for any trip. 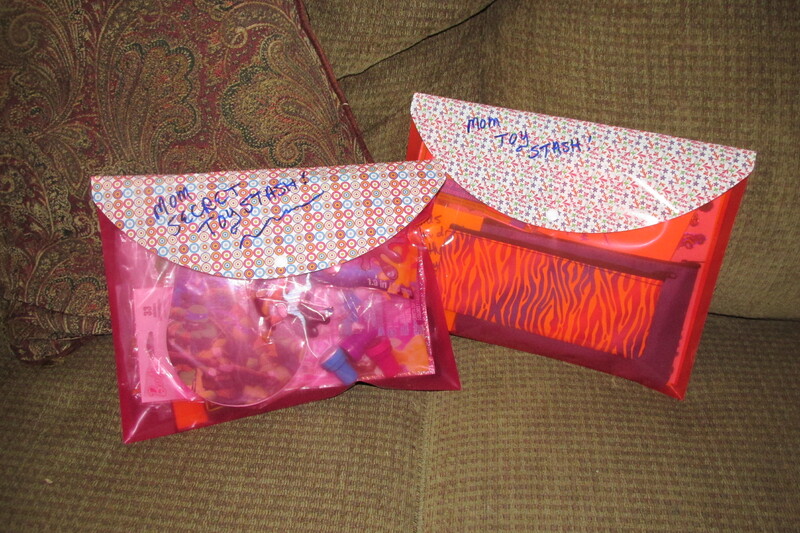 packing the secret stash in plastic envelopes keeps them handy. We often forget not everyone can afford an expensive laptop or iPhone. My local library is full of people looking for jobs or just wanting to connect with their loved ones via the internet. Computers are a luxury. Certainly the supposition would be that if you can afford a plane ticket you can afford all those electronics that entertain children. This is not always the case. I have a friend that is flying to Orlando thanks to “Make a Wish Foundation”. The children have never really travelled, as the health issues have kept the family at home. My hope is that the family has a wonderful time with many memories to treasure. My other hope is that the two young children do not drive their mother nuts during the air plane flights! Time to use my “old school” skills to put together a couple of “flight packages” for her. What did I use to keep my children entertained during long airport waits and flights? Well, stickers, coloring books, brand new markers, books, and flashlights. In fact I still always travel with small interesting flashlights to amuse upset children on planes. Least we forget, candy is dandy. especially if it is a treat just for planes. I know mothers that say “I let the children take a backpack of toys”. That’s fine, but nothing is more exciting than NEW TOYS. Even if those toys are from the dollar store. flashlights are really a lot of fun, and sticky notes mean instant art gallery anywhere. One of my favorites is the dollar store doctor set. Children love playing doctor and they don’t seem to care about how cheap the set it. They will love “listening” to your heart and looking in your ears. Over and over and over again. Next favorite, stick up notes. I have gone for a fairly large size. My children would love to endlessly make works of art using stickers and markers and then post them up all over the plane. Works of art appeared everywhere on the plane. Also good for decorating a hotel room. The sticky part makes it extra special as you can show off your art. Flashlights, these look like light sabers, are also wonderful. I’m not sure why children love flashlights but they do. I carry them on all flights I take and almost always give them out to unhappy children. As basic as a flashlight is, it is a never fail smile maker. 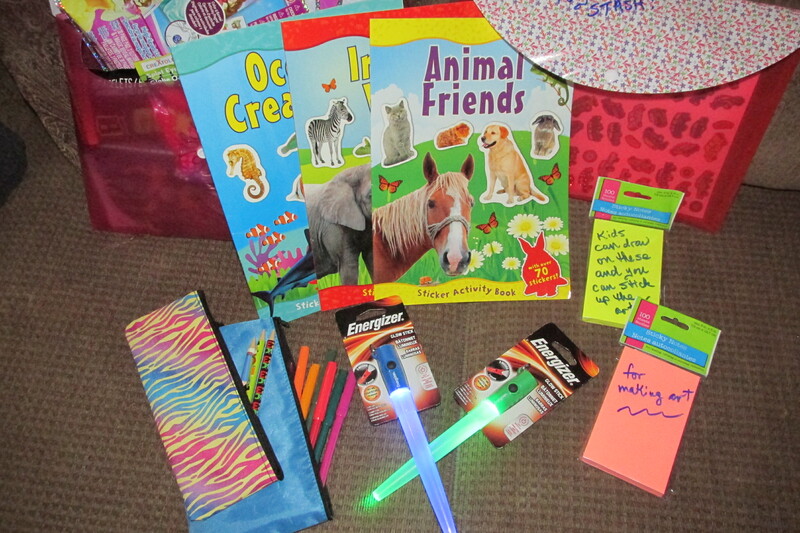 the doctor kit is always a big hit, and extra small cars and glow sticks are cheap and can be lost without worry. Small cheap cars (nice for the table on the plane) and even glow in the dark snakes and sticks, means more surprises mom can pull out when needed. The key is to not give these to the children at the start of any trip, but to keep them hidden away ready to for use when needed. 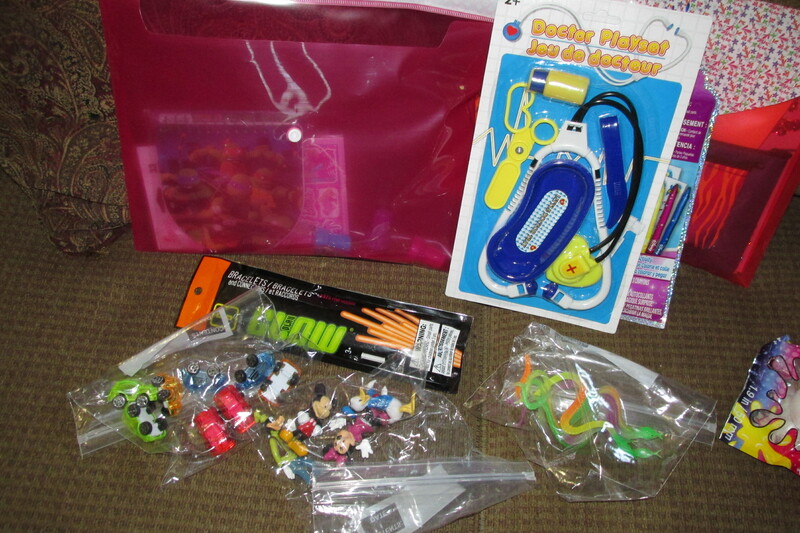 I enjoyed handing out toys for my children so it was a lot of fun for me to go shopping once again for two young travelers. If any readers would like to help this young family enjoy their vacation of a lifetime, I’m collecting donations to help. “Make a Wish” covers a lot but not every expense a family will have. Also, I hope the two children can have money to spend at the gift shops. Let’s face it, a tshirt can cost a lot at the tourist sites, but souvenirs are part of any vacation! Please let me know if you would like to help out! (Details upon enquiry). ‹ I’m Going to TAM. I Hope You Are, Too.